Summer unofficially begins Monday and of course the stores are filled with cool summer stuff like these super cute sand toys that can double as cookie cutters! 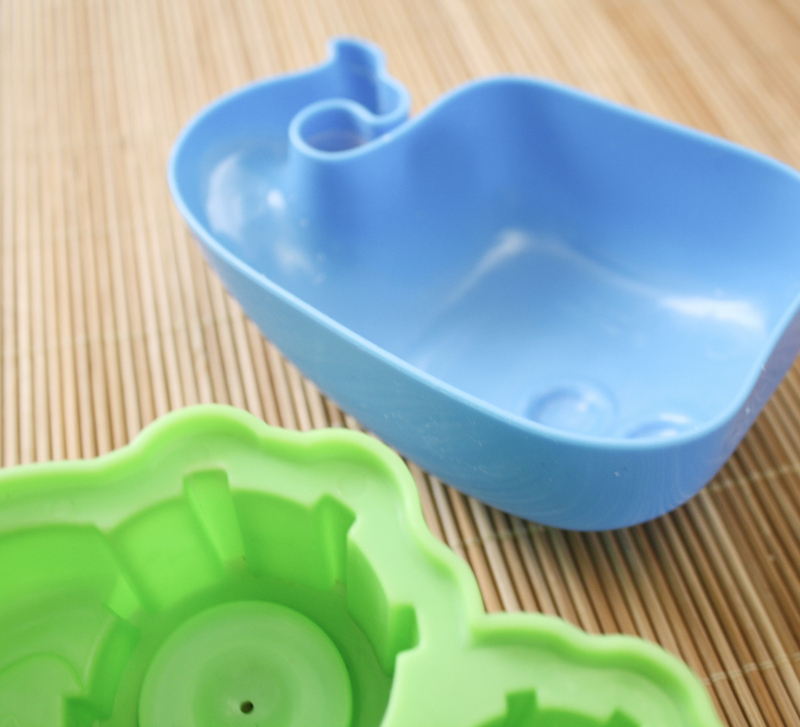 I'm guessing you could also use them as molds for Rice Crispy Treats and other things too. 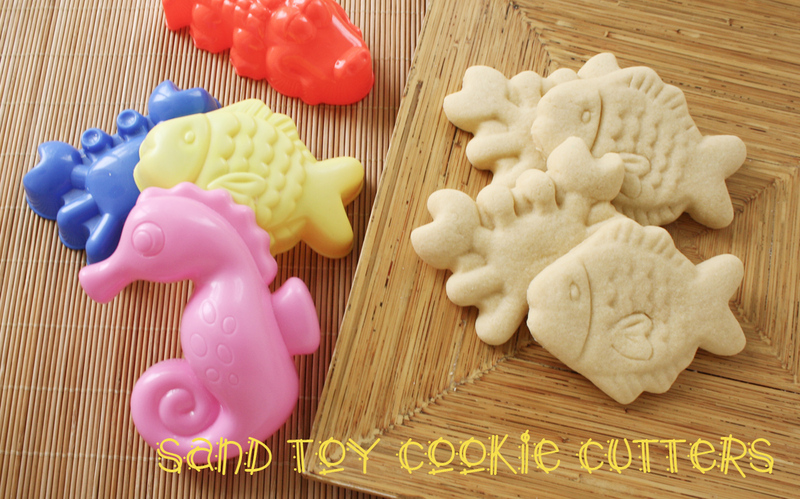 I'm sure I never paid attention to sand toys before but once I decided I could use them as cookie cutters I started finding them all over the place. Just look at these little dinosaurs I found at Target! I love the cute little T-Rex and the set of 4 was only a buck! You use the sand toys pretty much just like any cookie cutter. Be sure to flour them up really well though so the dough doesn't stick inside. If the dough does get stuck just whack the mold on the countertop and the dough will fall out. Because the edge of a sand toy is not as sharp as a real cookie cutter you might get thin dough wisps around the cookie's edge. (this often happens with plastic cookie cutters too) Don't worry about trying to clean up the edge of the cookie when the dough is unbaked. It's much easier to scrape away any little stray bits with a knife after the cookies are baked and cooled. Most of the sand toys I've found have an edge that is good enough for cutting cookie dough but once in a while you'll find an odd one that isn't going to work. The blue whale seen below has a good edge, but the green truck has a weird little lip on the edge and it's not going to work as a cokie cutter. Nuts. You can find these cute little guys in the toy department or in the "dollar-store" section that many stores like Target and Walmart have. Be careful though, if you are anything like me you might get a little carried away! If you're starting the holiday weekend early be safe and have a good one! 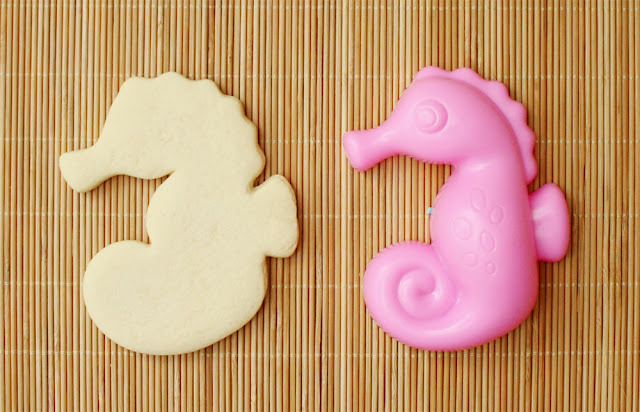 I love this idea and I am going to start looking for these cute new cookie cutters. Thanks for sharing! I rolled the dough to normal thickness but after cutting it I kept the dough in the mold and gently pressed it down all the way to get the impression. Then I smacked the mold on the counter and the dough fell out. 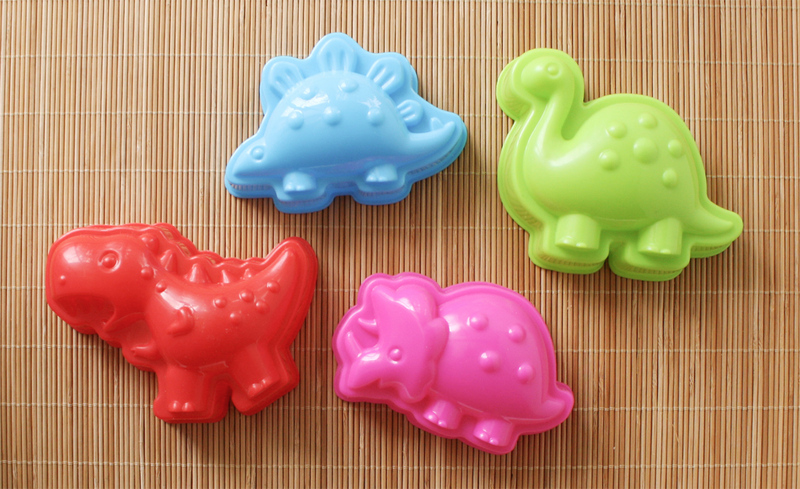 The toys are just "okay" for cookie molds. 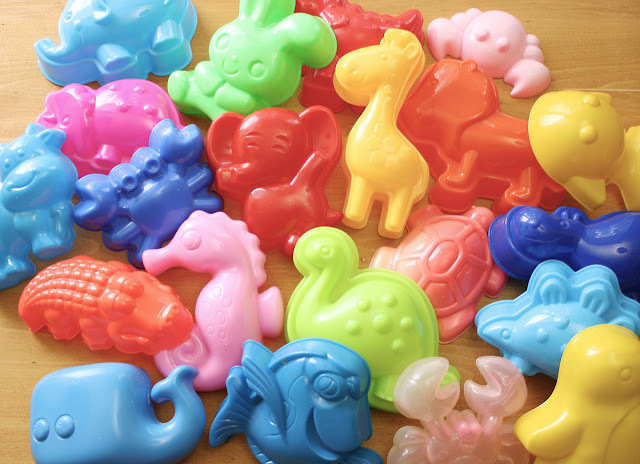 The fish and crabs kind of worked because the tops of the molds are fairly flat but most of the toys might be to curved to work really well. Gracias por compartir. Es una gran idea y muy interesante. I recently bought some very small sand toy molds from Walmart. They were so inexpensive. The shell mold is perfect for a peacock cookie cutter and way less expensive than the copper peacock cutter that was the alternative. Thanks for the great idea!!!! Boldly Go and May the Fourth Be with You!